Many stitchers avoid turkeywork stitches whenever possible, intimidated by the trimming that is needed to sculpt and shape the stitches into fur. It really isn't hard, though. You just need patience as I will demonstrate below. First, choose a turkeywork-type stitch. There are several variations of Turkeywork besides the classic version including Velvet Stitch, Ghiordes Knot, and Victorian Tufting. I used Jump Through a Hoop Turkeywork for my project as I find it easy and it doesn't leave an obvious row of tie-down stitches at the edge. 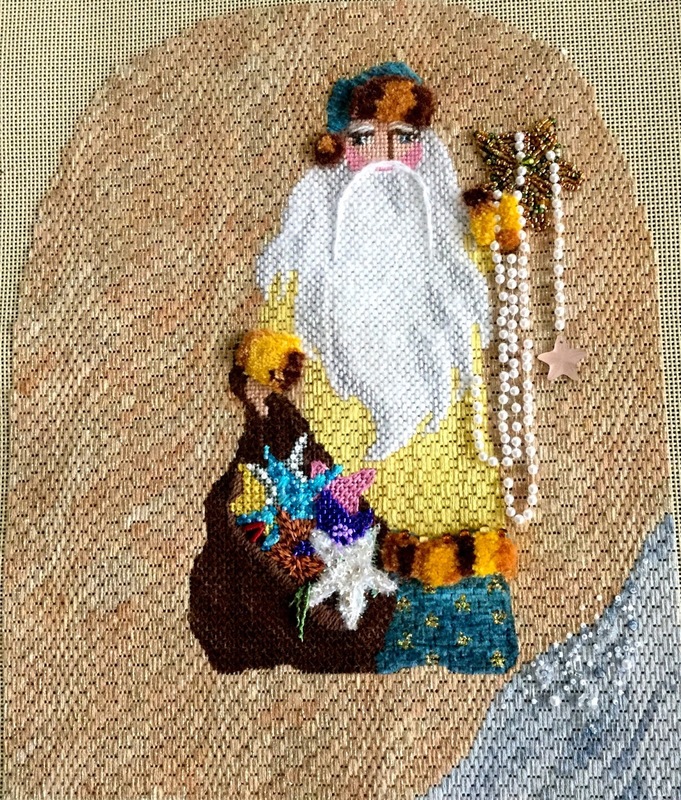 Sheena James has kindly offered a diagram of this stitch which you see above. Thanks, Sheena! 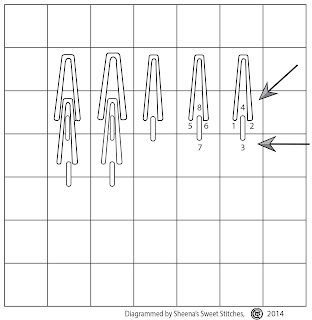 Needlepoint Now magazine also has a nice video and diagram of this stitch. 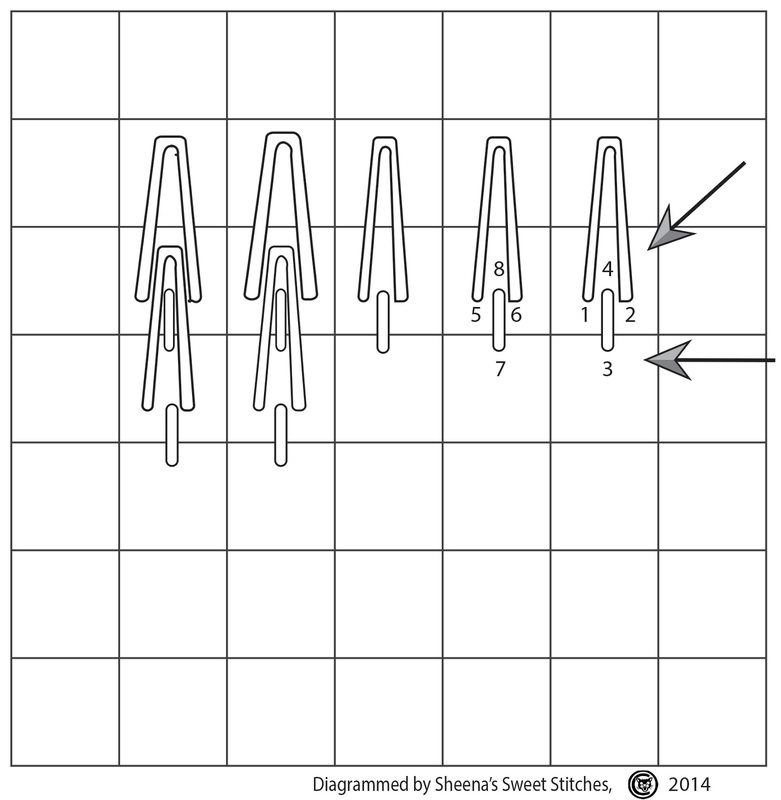 Note that Sheena and I use a tie-down stitch over one thread, not two as in the magazine's diagram and video. A wool or wool-silk blend gives the classic fur look, and you'll need a lot of it as turkeywork eats thread. 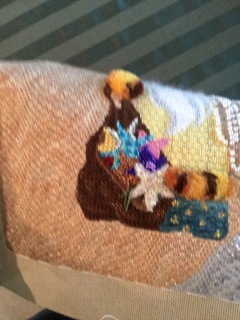 (I used Felicity's Garden which is a wool-silk blend for this project.) 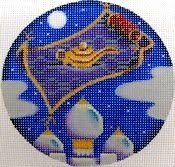 For special effects you can add other thread types such as Kreinik metallics. Just adding a few stitches with a metallic thread can give you a beautiful touch. 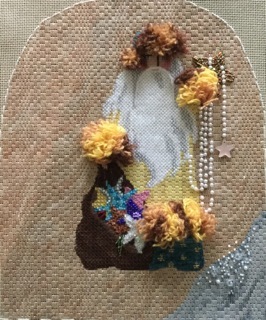 You also can use silk ribbon and omit the brushing needed to create fur, and I am told cotton perle makes a nice cut look although I have not tried this myself. However for this project I wanted a real fur touch and I like the luxurious look of silk-wool blends. By the way, I am stitching Leigh Designs's "Seeing Stars Santa" from her Seashore Santa series. For your first project I suggest you choose a canvas with fewer and larger fur areas, just to make it easier. My project has small areas with items in front or even with the fur, which means this is not a beginner's piece. I had to be very careful cutting around beads. You will need a brush of some sort for the best fur effect. I used my Bunka Brush from Japan that Rainbow Galley distributes. Judy's Boo Boo Stick will also work. The tiny brush end is particularly useful at reaching areas that are close to stitching you don't want to disturb. Very sharp scissors are a must. Some people like curved scissors but for me, the sharpest scissor possible is more useful than curved tips. This interesting article from the Textile Artist covers all sorts of scissors that stitchers like. To some extent the type of scissor is personal preference. It just needs to be really really sharp. 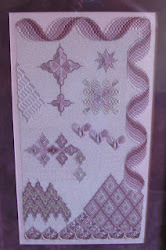 Colleen of Needle Works in Austin has a nice article on turkeywork and tools on her blog. Note that if you turn her diagram upside down, her Fish Eye Turkeywork is identical to Sheena's Jump Through the Hoop stitch. 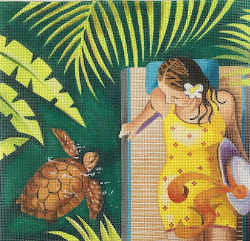 Make a copy of your unstitched canvas. This will come in handy later (see below). Stitch the entire canvas, ending with the turkeywork stitching done last. It is just easier to do the turkeywork stitches at the end since the uncut loops will hide any areas near it, making it very hard to stitch them. Trust me on this--I've tried it both ways! Carolyn Taggart suggests that the canvas be taken off stretcher bars to do the cutting and trimming. Thanks for the tip, Carolyn! It's invaluable. You can cut the loops in half before you do this if you like. Here is my project with the hat loops cut but the sleeve and robe hem stitches uncut. At this point he's a real mess! Once the loops are cut, start trimming, working a little bit at a time. By a little bit, I mean removing 1-2mm each cut. Be patient! It will take you some time to cut the fur down to the length you want as you will remove only a bit at a time. But don't rush. Just snipping a tiny amount each time helps prevent over-trimming. It will take a lot of time but this is where patience pays off. The five areas of turkeywork took me probably eight hours total to trim and sculpt but I've done this before. I would plan on using 90 minutes to two hours at least on each area you cut to shape. As I said, patience is key but the lush fur is worth it! Brush the cut area frequently with your bunka brush, finger, scissors tips, anything. I tend to trim about 5-10 times, then brush and start trimming again. Brushing will raise uncut loops and fuzz the thread to make it furrier. Watch for a color change in the area after brushing. That is a missed, uncut loop that has magically appeared among the cut ends. Bend the canvas in your hands (you've taken it off the stretcher bars, remember?) to make the area to be trimmed stand away from the other stitched areas and make reaching the side of your fur area easier. Refer to your copy of the canvas frequently to decide how and where to trim and sculpt. You won't be able to see the outline of your area on the canvas because of the turkeywork mass, so a reference photo will come in very handy. There will be a lot of fuzz you'll need to keep off your canvas. I worked on a tray and lifted my scissors with the cut bits resting on the blades off the canvas and dumped them on the tray to the side. You'll still have some bits on the canvas but you can use low-tack tape to remove excess fuzz. A loop of masking tape, blue painters tape, or pink hair tape will remove the bits. Roll it into a loop around your finger and carefully dab it onto the canvas. It will remove the fuzz without lifting your stitches if you don't press too hard. You can also cover the canvas areas without turkeywork with paper or cling wrap although I had so many areas to cut this wasn't practical for this design. Be patient. Keep trimming a very little at a time with very sharp scissors, referring to the copy of the canvas you have at hand to keep the shape you need in mind. Be patient! I can't say this enough. A little at a time is the way to shape this. I repeat—be patient. I started out with loops that were around three-quarters of an inch high and ended up with tufts that perhaps were a quarter inch high at the most. However, what height you need depends on your canvas. Some designs need higher fur than others. I had strings of pearls and beads next to or over my fur so I wanted a much lower profile than you might wish. I also had multiple areas that needed to be approximately the same height. It is possible to add loops back to an area if you have cut too far but you will have to carefully bring a length of thread to the front, leaving a long tail without a knot on the back. Now bring the tail to the front and trim both ends to the length you want. This needs even more patience than the trimming needs, so be careful when you cut so you don't have to add more length later! This is the end result. Good luck with yours. UPDATE: Here is Suzie's take on turkeywork. She does it with a straight stitch that she calls brick stitch.